Seibertron.com member reluctantyouth dropped by to let us know he acquired the highly anticipated Transformers: Age of Extinction Deluxe Lockdown at a Target in Peoria, IL. The figures also appear to be on sale for $9.96. Happy hunting! Shouldn't this have gone in this thread? I am more and more puzzled by the fact that there is no announcement of that specific lost age easy Optimus coming to North America. He seems integral to the line over there being at it's forefront. Then again, they are not advertising for the small one step optimus. And it wouldnt be for redundancy, since they have 2 grimlocks. Something odd is going on with all this. Its about time this guy hit retail. Can't wait to find it! william-james88 wrote: I am more and more puzzled by the fact that there is no announcement of that specific lost age easy Optimus coming to North America. He seems integral to the line over there being at it's forefront. Then again, they are not advertising for the small one step optimus. And it wouldnt be for redundancy, since they have 2 grimlocks. Something odd is going on with all this. Which figure are you referring to? LA01 Battle Command Optimus Prime. Which wave is he in? Superwheeljack wrote: Which wave is he in? None, that's what is crazy. There is no planned Hasbro release for the tent pole figure from the Lost Age Easy line. That boggles my mind. It seems this whole line is based on the toys' play factor of which there are 2. There is the instant transformation and the interaction with other figures. The lack of LA01 in North America makes the line almost pointless since it denies certain the play factor of these toys (such as them being the right size to store in a trailer). I am not complaining as a collector (I wouldnt buy any of these anyway) but I am really puzzled and curious at the business angle. It seems Hasbro was far more involved with the gimmicky flip and change transformers while Takara preffered the interaction factor. hasbro just seems to be going at it in a very half assed way. I am sure they would sell much more of the easy transformers to kids if they had that LA01 to go with it. I would have guessed mybe a christmas release but we should have had some word of it by now with all the recent cons. Those are Movie Advanced Series toys. Has there been any announcement if some of the Lost Age deluxes that are being released in Japan will make over here to the US, Wheeljack, Soundwave, Dino, and Dispensor? It just seems that this movie toy line has been real light on figures, that we know of, no counting all the recolored story exclusives. Also are there plans for more Decepticons other than Galvatron and Lockdown? Balgorra wrote: Has there been any announcement if some of the Lost Age deluxes that are being released in Japan will make over here to the US, Wheeljack, Soundwave, Dino, and Dispensor? It just seems that this movie toy line has been real light on figures, that we know of, no counting all the recolored story exclusives. Also are there plans for more Decepticons other than Galvatron and Lockdown? For the former, those toys were added to the Movie Advanced line as both filler and as a tribute to the past three films. For the latter, the AOE line is only going to last till the end of this year, and there really weren't a lot of named bad guy robots in this movie what with Cemetery Wind being the main antagonist group. Lockdown was the man robot villain, but not a Decepticon. Galvatron was more of a plant for the next movie, and the KSI robots were just fodder. Yeah I knew Lockdown is technically not a Decepticon, just did not want to say if for the few people that may not have seen the movie yet and did not want spoilers. But I figured they would at least do Stinger and maybe the dump truck since that mold was shown awhile ago, think it was an earth day announcement from Takara. So is lockdown his own wave or is he packed with other figures? Hes obviously not in slashes wave cause that just started to arrive here & no lockdown. 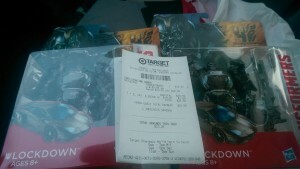 Also target has had deluxes on sale for 2 weeks now, i reported it but no one seemed to care. Lockdown is in the 2.5 revision from what I have seen. Lockdown should have been a leader class. That deluxe is OK but his arms are to long and his head is a bit Silver-surfer for my liking. Still plan on picking him up. 10 bucks for a Lockdown? Deluxes cost 27 euro's in The Netherlands, that's 36 dollars! Voyagers use to cost that much in the Armada Days. Dafuq is going on in Europe? + we probably won't even see Lockdown in stores. Seriously, You americans are lucky. noctorro wrote: J. Howard Christ! Generations has always been expensive here, if you can even find them! I've only seen wave 1 of the FoC series, and the prices were already nothing to sneeze at: €25! You are absolutely right. We tend to take it for granted and forget the plights of other fans. We need to be more thankful for what we do have and quit complaining as much as we do. 3,983 pages were recently viewed by 1,048 unique visitors. This page was viewed 1 times on Friday, April 19th 2019 5:34pm CDT. © 2019 Seibertron, Inc. DBA Seibertron.com. All Rights Reserved. Established June 2000. Seibertron.com is owned by Ryan Yzquierdo.